Let me continue with 51123. 3275-NV1 : Registered by Automobiles Ettore Bugatti at Préfecture du Bas-Rhin on 15th April 1931 as type 51 number 51123. Yes, one of the works cars for Monaco. Correct, openly available sources say July, and more confidential ones even name exact date and final customer. Why? Because he drove a works car with this registration at Montlhery? Not only La Baule but also Spa had been LATER than the cars sale and physical export. So for sure this was NOT 51123. By comparing the photos with #42 and #28 one can aeasily see that the position of the tail registration is different. Different is also the position of front registration on the #28 photo compared with that on the Williams / La Baule car (photo below). Crank between "5" and "N" versus between "7" and "5". Also the radiator of #3 is wider than that of #28. As a conclusion, we are talking about 3 different cars, and even 4 if we add Varzi at Monaco 1932 (which I believe was 51139). All this can be easily puzzled together - or apart if you like - by accurate and professional research. Identifying Molsheim cars by their registration is not possible, believe this is common knowledge. Or at least it should be. No further comment on this, but as a matter of fact now all photos in the 51123 file - except possibly that of Connelli of Montlhery - do NOT show 51123! 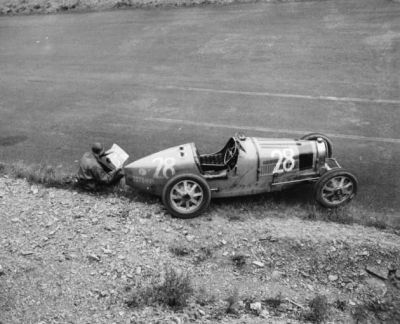 There appears to be some confusion re Bugattis numbered 28 in the Belgian Grand Prix.In 1931 number 28 was attributed to Williams and Conelli as per my picture showing Conelli.In 1933 this number was attributed to Marcowics. This probably was an earlier type 35 (note smaller radiator) into which a 51 engine had been put. Also note the twin fuelfillers.As shown, he had an accident and was a D.N.F. 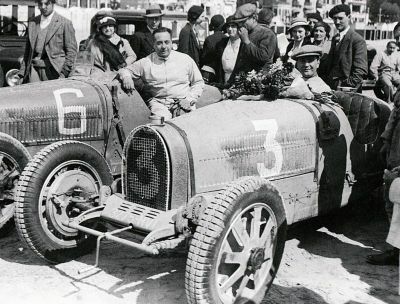 In 1931 number 28 was attributed to Williams and Conelli as per my picture showing Conelli. In 1933 this number was attributed to Marcowics. Nobody willing to comment this?? Williams/Conelli at the 1931 Belgian GP at Spa had #4. With the highest race number there was #24. ...as per my picture showing Conelli. 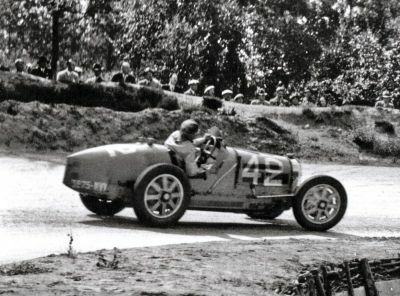 The car is that of Louis Chiron (#51135/4922-NV1) at the Masaryk GP at Brno 1931. However, the picture may show Conelli who possibly was reserve driver, I do not know. In 1933 this number was attributed to Marcowics. This probably was an earlier type 35 (note smaller radiator) into which a 51 engine had been put. 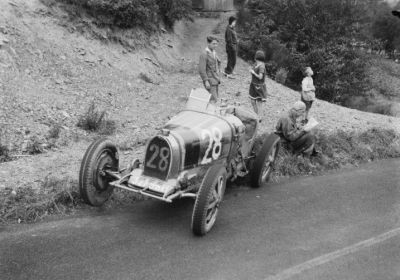 In 1933 at Spa Edgard Markiewicz (aka "Marko") had #20. He was Swiss, and his car was painted red with white bonnet. And also here highest number was #24.